More TAXES fron the Ban Man. Why not start stealing citizens houses and sell it back at a fraction of the market value, with the false pretense that your saving lives, you done it with HTA 172. "The Dalton Gang" strikes again! The Ontario Liberal government is expected to introduce harmonization of the province's sales tax with the GST in its budget on Thursday to ease costs for struggling businesses and stimulate the province's sagging economy during the global recession. Opposition and business leaders have long pushed for the measure, arguing the province's corporate taxes are too high, hinder investment and make the province less competitive. 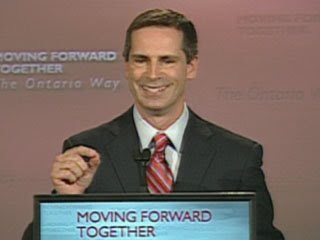 Premier Dalton McGuinty hinted the move was in the works after admitting he had heard from numerous business groups advocating a merger of the taxes. Provincial Finance Minister Dwight Duncan has already revealed the coming budget will bring Ontario into a deficit of $18 billion over the next two years, along with a $27.5-billion infrastructure program to create jobs in the wake of hundreds of thousands of jobs lost in the province's manufacturing sector. But after a series of good-news pre-budget announcements on infrastructure and education funding, the premier cited the need for budget secrecy for his inability to answer opposition MPPs' questions Tuesday on tax harmonization. During question period at the legislature, the NDP pointed out the single sales tax would also mean consumers would be left paying higher taxes on basic goods such as diapers, shoes and children's vitamins. New Democrat Leader Andrea Horwath expressed concern the merged tax would "nickel-and-dime families." "These are all the kinds of items, the kinds of things people buy every single week," Horwath told the legislature. "Especially in times of difficulty, families do not need this extra tax." McGuinty acknowledged the move could increase the price of some consumer goods currently exempt from the PST. But he said Ontarians would eventually understand the government's need to make hard and unpopular decisions. "What Ontarians want us to do is to do what's right," McGuinty said. "I don't think that we've been put in a position of government to choose what's easy." The Ontario Chamber of Commerce has estimated merging the taxes would save companies about $100 million a year, but acknowledges the price of some household goods would increase in the short-term.